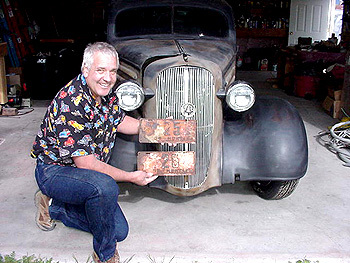 Steve Hachenberger shows the historic 1936 plates in front of his 1936 Chevrolet 5-Window Master Coupe, May 2008. Photo, courtesy of Steve Hachenberger. The late Charles Henry Davis, a Philadelphia native and long time resident of South Yarmouth, Massachusetts, established the National Highways Association in 1911, decades before the building of the National Highway System came to fruition under President Dwight D. Eisenhower. Mr. Davis advocated a "Four-Fold" highway system: the United States Highways, totaling 100,000 miles; State highways built with Federal aid and also totaling 100,000 miles; and local roads built by towns and counties without State or Federal aid would all connect to the 50,000 mile National Highways Network. Davis traveled the country in two cars promoting his Four-Fold System. One car was his Hudson and the other was a back-up car in case the Hudson developed mechanical problems. As a promotional idea, he got all of the States (48 of them at that time), the territories of Alaska and Hawaii, six "Dependencies" to include Guam and Puerto Rico, nine Canadian providences, the Yukon Territory, and Newfoundland as well as several territories to the south of the United States, including Panama, to issue their license plate number 25 to him. He attached all the license plates to his Hudson while the second car bore the insignias of all the current automobile societies in the country. 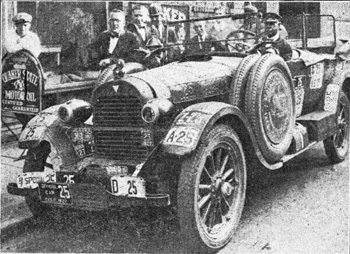 This unusual two-car caravan drew much attention to his cause as it toured the United States. Charles H. Davis (left) standing beside his Hudson. The Hudson was decorated with the Number 25 License Plate from all the States and U.S. jurisdictions. Photograph, courtesy of Richard Weingroff. Photo, circa 1920s . Two of these license plates found their way home in early May of this year. Mr. Steve Hachenberger of Hamilton, Montana, found two of the 1936 Montana license plates advertised on eBay. Winning the bid, he donated the 72 year-old tags to the Montana Department of Motor Vehicles in Helena. A local newspaper published an article on Mr. Hachenberger's unique, historic donation to the DMV in Montana's capital city. For additional information on Charles Henry Davis, see Richard F. Weingroff's Good Roads Everywhere: Charles Henry Davis and the National Highways Association on FHWA's Highway History Web site at: https://www.fhwa.dot.gov/infrastructure/davis.cfm. Many thanks to Steve Hachenberger and Richard F. Weingroff for supplying the information and photographs contained in this article.